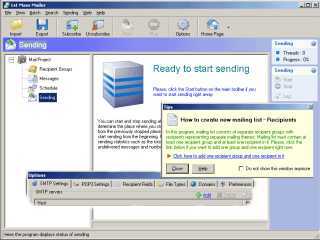 1st Mass Mailer is a very fast mass mailer with a lot of useful features. This bulk email program is intended for sending personalized email messages to mailing lists of respondents. 1st Mass Mailer is used by many internet professionals and on-line store owners to notify their customers about various events and promote their new products. 1st Mass Mailer lets you organize a subscription on your web site its easy-to-use and configuration is very simple. The program allows to quickly import the list of respondents into its internal database do filter based manipulations on the list sort and search for duplicate emails and enable or disable individual emails. 1st Mass Mailer allows you to create and manage large mailing lists and to generate personalized messages from predefined templates while sending. It lets you define multiple independent SMTP server connections and utilizes the latest in multithreading technology to send emails to you as fast as it is possible. You can create separate customized mailling lists with varying number of fields (Name Address etc.) which contain information about the recipients. You can easily define messages and insert macro substitution patterns to be replaced by information from the database for each recepient just before dispatching. You can use all the standard message formats like plain text HTML or even create a rich content message in the Microsoft Outlook Express and export it into the program.